Sustainability is the buzzword of this generation, and nothing brings the issue of environmental awareness to life more powerfully than Wood & Wood. Performed in silence by two wooden people who walk through crowds, among trees, fields, and on stages, the walking characters enchant audiences with their intricate, life-like wooden movements and gestures. Wood & Wood are made of 100% wood – and, of course, they have an ECO certifcate! 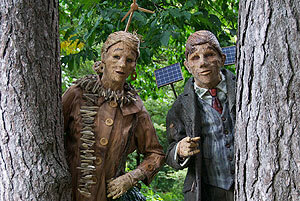 Fuelled by wind and solar energy and equipped with their eco-mobile, these two masked characters wander through their wooden world clutching a grass suitcase filled with all their other bio-powered accessories Listen carefully! When they pass by you can hear their joints creaking! During their travels they get up to all sorts of things: they greet a tree every now and then, tank up the sawdust in their heads and carve a heart into their wooden clothes. Wood & Wood is non-verbal, mobile mime at it's best: fascinating, poetic and entertaining all at the same time. Wood & Wood : wood that works to make your heart smile. This mask characters are walking between the audience. Normally when we play this act we also use an electric eco-scooter. When we have to travel by plane we are not allowed to transport the eco-scooter because of the Li-Ion batteries. In that case Wood & Wood is played on two non-electric steps, also with a special green decoration. A dressing room is needed.